You can select a batch of invoices and print them all in a few clicks. On the Invoices tab, in the Search pane, set the appropriate filter options, and click Search. Select the check boxes next to the invoices that you want to print, and click Print on the toolbar. 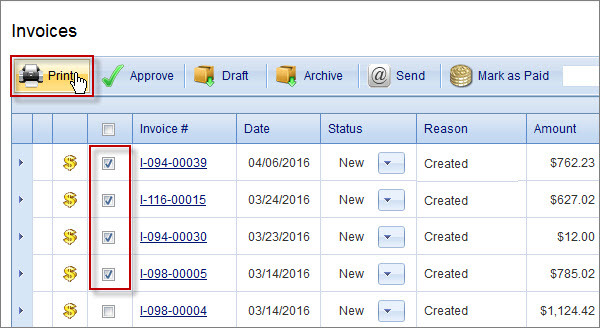 Note The printout for all selected invoices will be shown in a separate window with each invoice on a separate page. …while in other browsers such as Google Chrome and Mozilla Firefox, you can only click Export on the toolbar, and then save the printout as PDF file for further printing.